Anyone who has had the pleasure of going to Glengariff Historic Estate will tell you this is a venue with wow factor. Needless to say, this bride and groom loved the incredible backdrop and sweeping views so much they booked their wedding here. 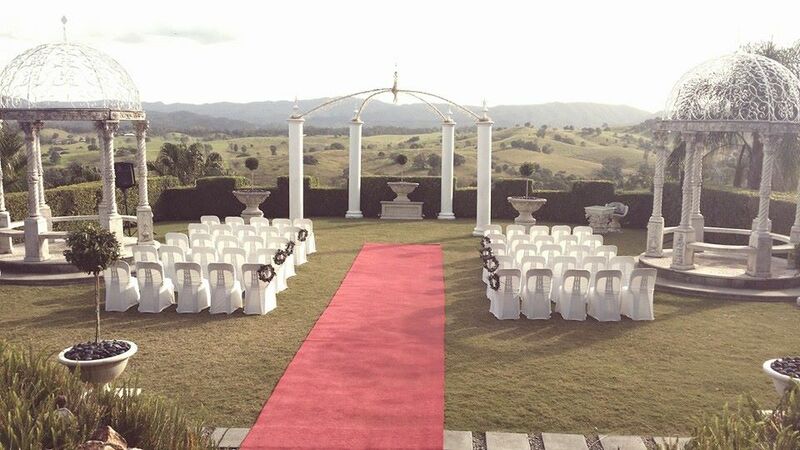 Being approximately a 45 minute drive from Brisbane City and with most of their guests traveling from a far, many from overseas, they organised a full size bus to transport their guests to and from the venue for convenience. While planning the transport they came up with a great idea, ‘as we are providing transport, why not surprise the guests with the venue so they get the full wow factor when they arrive here too’, so that’s what they did. I loved watching the guests ‘wow’ as they were greeted with this view of the breath taking ‘surprise’ wedding venue, at the lovely Glengariff Historic Estate in Samford. The couple enjoyed a happy and heartfelt ceremony with the grooms sister who traveled all the way from the UK to be here, given the honour of ‘Best Woman’ much to her delight. Wishing the newly weds every happiness for your future together and thank you for choosing me as your Glengariff Historic Estate wedding Celebrant. If you enjoyed hearing about this exciting wedding and are looking for a Celebrant for your Brisbane wedding, Cara would love to hear from you. Contact Brisbane City Celebrants for more information and to confirm availability for your special day.